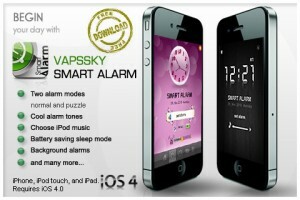 Vapssky Smart Alarm iPhone App Review. I must warn you. Those of you that really need their cup of joe before even attempting to do anything else in the morning, you won't get a kick out of this next app. If you're constantly getting up from bed, putting one your slippers sideways, and saying good morning to the cat on your way to the bathroom, then solving Math problems bright and early might not be up your alley. If on the other hand you're looking for a way too boost your morning routing and jump start your day, then Smart Alarm from Vapssky is your ideal morning coach. 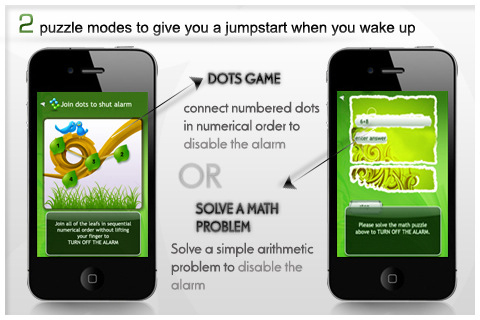 The app works just like a regular alarm, just that in order to shut it off in the morning, you need to solve the Math problem or the Dots puzzle game that it throws at you. Say what? Solve Math problems in the morning? Don't worry! You're not up against irregular expressions and Pythagorean problems. The Math problems themselves are just simple equations you wouldn't think twice about the answer to at mid-day. The simplest example of it is "46 - 23 = ?" The Dots game however was more interesting to me. You need to connect a number of dots in sequential order without lifting your finger off the screen to turn off the alarm. It's good to know that only a correct solution to either type of problem will turn off the alarm. The lazy trick, though, is to hit the home button on your iPhone when the alarm goes off and you're off the hook. There's no need to solve any puzzle and you can safely go back to sleep. That would be cheating, of course, and also besides the point of it all. The good thing about Smart Alarm is that it can run in the background even after you quit the app. This is not restricted to post-iPhone 3G devices. With the 3G, if you close the app or lock the iPhone, it will still wake you up at the scheduled time, but instead of playing your iTunes music or the chosen alarm tune, it will scare the bejesus out of you via a built-in buzzer noise 30-seconds long. 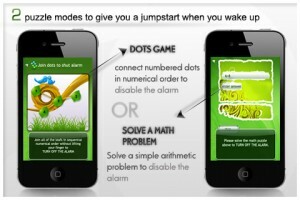 Your chosen alarm will start as soon as you start solving your morning puzzle. 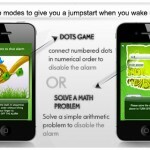 What the developers suggest however is to use the app's built-in sleep mode. Sleep mode basically dims your screen, but doesn't quit the app. I wondered how much battery that ends up eating. It turns out that a fully charged iPhone will run for 8 hours when the app is in sleep mode. The protection for this is built in to Smart Alarm. It's designed to auto-lock your iPhone when its power reaches 20%. This is of course true unless you have a "never auto-lock" option set in your iPhone's settings. You can set up 8 different alarms, but each can repeat daily. Smart Alarm also features five pre-set tones for you to choose from. 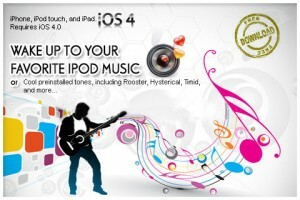 Of course, there's always your iTunes music library and you can choose your favorite tunes to wake you up. As for the visual options, Smart Alarm lets you choose between 5 different but beautiful themes. Other settings include choosing a time format (12h or 24h), clock display (analog or digital), setting your snooze timer or the alarm duration. Smart Alarm from Vapssky is designed to get your mind up and running in the morning via simple puzzles, but I can possibly see this as a good substitute for my regular alarm clock, albeit there is the pressing concern of battery life. Perhaps it would be a good way to not say goodbye to my iPhone 3G dinosaur and instead turn it into the most sophisticated alarm clock. Ever. What do you think of Vapssky Smart Alarm ? scroll down for our comment section.